When an employee unexpectedly left, Denise Sebastian, Director of Financial Aid at Mineral Area College (MAC), knew it was time for a change. “It prompted us to evaluate our overall situation,” she explains. One employee was managing the Missouri-based school’s financial aid verification process—more than 1,500 verifications a year. Sebastian needed a more efficient solution. Alternatives before her included adding more people to her team, or outsourcing—neither was ideal. 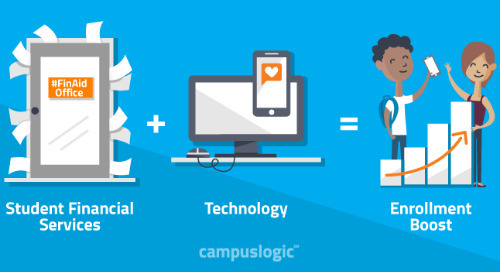 StudentForms—part of the CampusLogic student financial services platform—simplifies financial aid processes (verification, professional judgements, SAP appeals, and more) by making FinAid easy, mobile, and personalized. 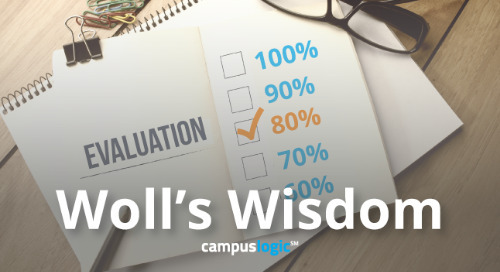 Driven by ISIR logic, StudentForms offers a digital portal to manage tasks, workflow-driven file review, auto-indexed documents, automated student communications via text and email, and secure document upload from my device. And because CampusLogic is cloud-based, MAC was up and running—and staff fully trained—in less than two weeks. Previously, Sebastian’s team was averaging three to six weeks on document collection, per vereification. Today it’s down to one week or less. Financial aid processing time was, on average, eight to ten days—that’s been reduced to within 24 hours. Automatic document imaging means no more indexing or scanning, and regulatory changes are handled automatically. At minimum, Sebastian estimates CampusLogic has helped her team save 40 hours a week, translating into 2,080 hours a year. Is Your College Considering Consolidation? Timing truly is everything when it comes to filing a FAFSA. Carlo Salerno, VP of Research, shares thoughts on new report that highlights patterns in FAFSA filings during 2018-19 aid year. 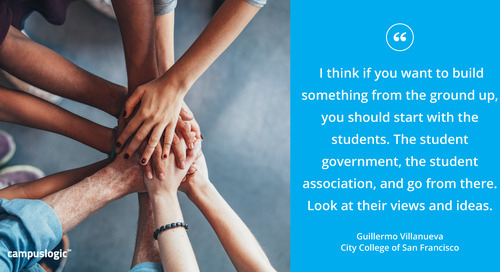 Guillermo Villanueva, City College of San Francisco’s Dean of Financial Aid & Student Success, talks with CampusLogic’s Amy Glynn about helping under-represented students realize their dreams. 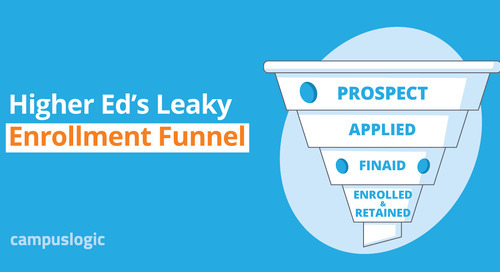 This infographic will help you identify where students are falling out of your funnel--and offers tips and tactics to help them retain and complete. Sending upwards of 20,000 paper award letters a year, Ivy Tech needed a better solution to standardize student comms across 19 campuses. Access to financial aid is key to increasing enrollment and retention. Technology makes this process easier with self-service tools that allow students to engage whenever and from wherever they want. New studies are inspiring new ways of thinking about how student-centric, mobile-friendly award letters truly drive responsible borrowing. 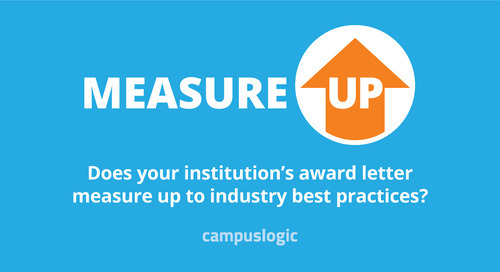 Will your award letters pass a best-practices assessment? With the rise of scholarship scams, it's important that students spend their time and energy applying to valid opportunities. Use this checklist to help avoid #sketchy scholarships. Identifying scholarship providers who have ulterior motives (vaping? Fees?) is getting harder. 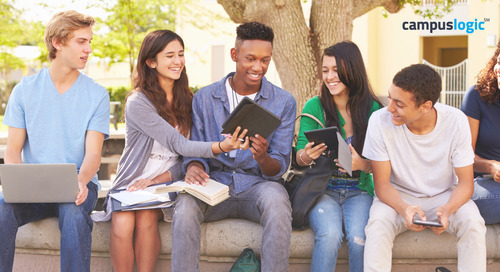 Our vetted external scholarship database makes it easy for schools to provide relevant, trusted options. Amy Glynn shares her tips for simplifying and streamlining verification. 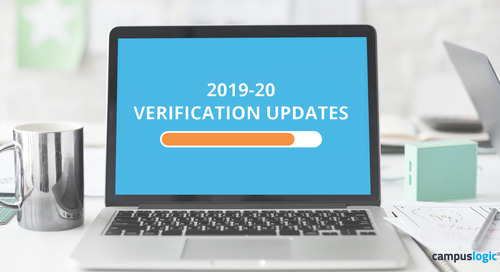 Download 2019-20 Verification Worksheets—complete with updated dates. 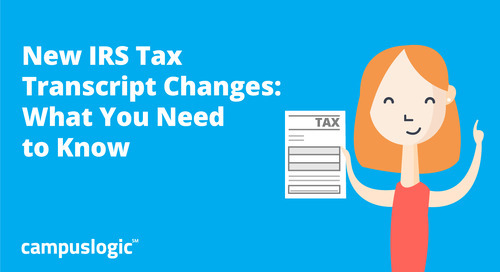 New changes to the IRS Tax Transcript mean changes for your financial aid office. 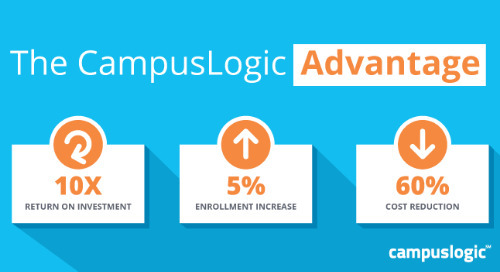 Amy Glynn explains what this means for CampusLogic customers. 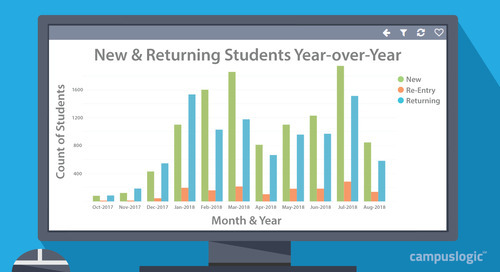 Ever wanted an easy way to visualize how many of your students are new, returning, or re-entering your university? Product Manager Michael Macias has the answer. 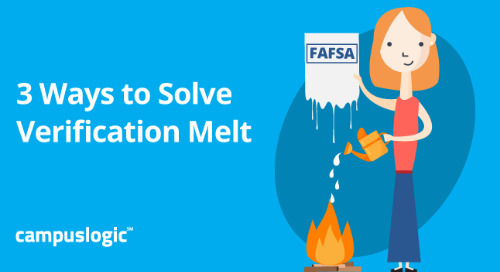 Ensuring students aren’t falling into the verification melt is key to pursuing their education. Amy Glynn shares why simplifying the FAFSA may not be the best solution. If you were a student at your school, what grade would you give your Financial Aid office for customer service? 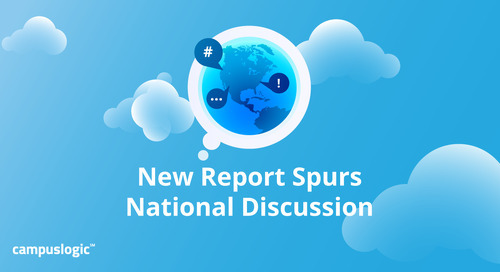 Read how underperforming in the FA Office can create better service experiences. Leading change is hard. You need to do things differently to reach students—and to meet their expectations. Here’s how D’Youville drove student adoption of its new, mobile, FinAid process. 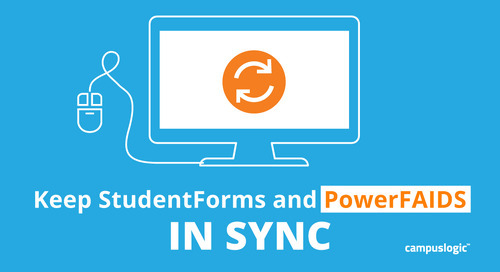 CampusLogic just released a new, built-in integration with PowerFAIDS® to keep both products in sync—no manual entry required. 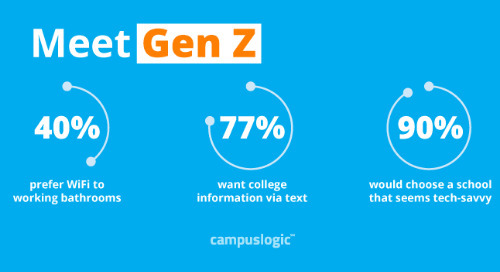 Swiping on phones and tablets since birth (almost), Gen-Z knows how to find what they want online—and they’re knocking at higher ed’s door. Is your office ready? Is your net price calculator creating a hole in your enrollment funnel? A personalized, branded NPC guides prospective students to the right next steps.